The U.S. National Under-18 Team opens its play in the 2018 Under-18 Five Nations Tournament against Sweden at 3 p.m./9 a.m. (local/ET) at Buly Aréna. The U18s will play four games in a span of five days. The U.S. and Sweden met four times in the 2017-18 season of international play, and Team USA emerged victorious in three of the four games. The Under-17 Team met Sweden for the first time on Nov. 9, 2017 for the U17 Challenge Quarter-Final and won 5-1. Cameron Rowe (Wilmette, Ill.) was named the U.S. Player of the Game, and Cole Caufield (Stevens Point, Wis.) took the tournament lead with nine points after assisting on a goal from Jack Hughes (Orlando, Fla.). The current U.S. National Under-18 Team met Sweden a second time during the Under-17 Five Nations tournament in Veliky Novgorod, Russia, and recorded a 10-2 win. The U.S. scored 10 unanswered goals, including a hat trick from Matthew Boldy (Millis, Mass.) and two goals from Caufield. The U.S. National Under-18 Team competes in two Under-18 Five Nations Tournaments every year, first in November and the next in February. The 2018 Under-18 Five Nations Tournament features the Czech Republic, Sweden, Switzerland, and Finland. Each team plays four games per tournament, and the points are awarded as follows: wins (3 points), overtime wins (2 points), and overtimes losses (1 point). The tournament winner is based on the team with the highest point standing after four games. The U.S. has placed first in at least one of the two yearly events dating back to the 2007-08 season. In total, the U.S. has won the event 20 times since the U.S. began participating in 1997-1998. The U.S. has won both of the yearly tournaments five times (2003-04, 2008-09, 2009-10, 2010-11, 2016-17). To view the full history of U.S. first-place finishes at the Under-18 Five Nations Tournament, click here. Last year, the U.S. tied with the Czech Republic for third place in the 2017 Under-18 Five Nations Tournament in Hämeenlinna, Finland, and ended the contest with a 1-0-2-1 record. The U.S. National Under-18 Team finished with a 3-1-0-0 record and took first place in the 2018 Under-18 Five Nations Tournament in February, held at USA Hockey Arena. Jack Hughes (Orlando, Fla.) will serve as the team captain for Team USA at the 2018 Under-18 Five Nations Tournament. Matthew Boldy (Millis, Mass.) and Marshall Warren (Laurel Hollow, N.Y.) will serve as alternate captains for the U.S. The U.S. roster is comprised of 20 full-time U.S. National Under-18 Team players, part of the U.S. National Team Development Program. Two non-NTDP players join the roster as well: Cade Webber (Meadville, Penn./The Rivers School) and Robert Mastrosimone (East Islip, N.Y./Chicago Steel). A complete U.S. roster can be found here. 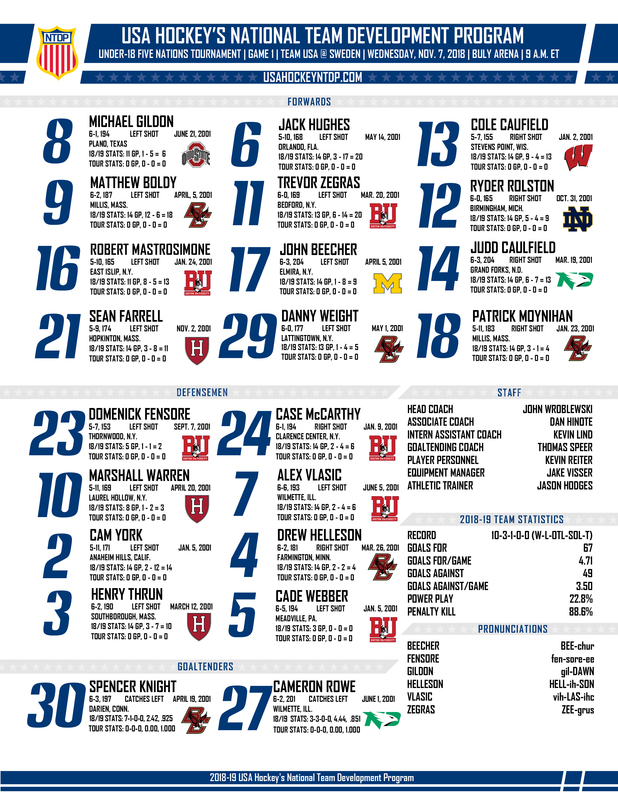 The U.S. National Under-18 Team is led by head coach John Wroblewski (Neenah, Wis.), assistant coach Dan Hinote (Elk River, Minn.), intern assistant coach Kevin Lind (Homer Glenn, Ill.) and goaltending coach Kevin Reiter (Pittsburgh, Penn.). 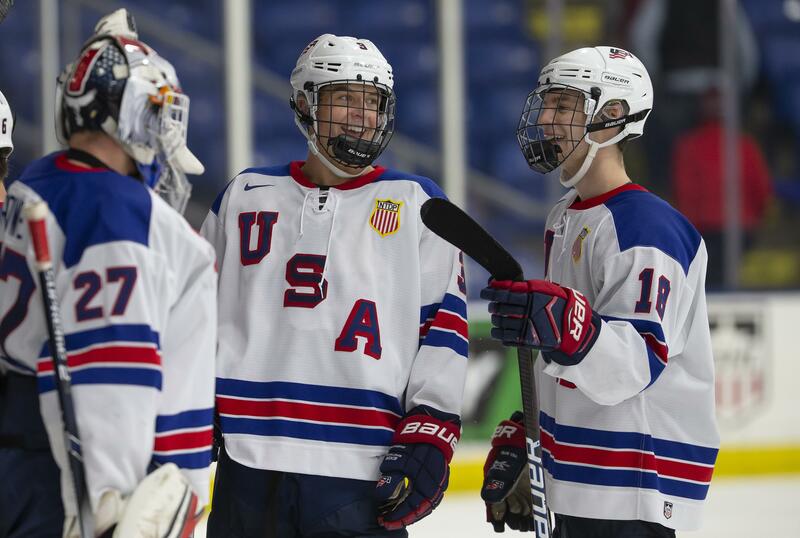 The current U.S. Under-18 Team enters the Five Nations Tournament undefeated in international play and earned first place in its three international tournaments. The U.S. National Under-17 Team took home a combined 14-0 record internationally during the 2017-18 season. The U.S. finished 7-0 in the 2017 Under-17 Challenge in Dawson Creek, B.C., taking home first place for the first time since January 2014. The 2017 Four Nations Tournament in Järvenpää, Finland resulted in a 3-0 record, with five U.S. players ranking in the top 10 scorers of the tournament: Cole Caufield (4-6-10), Trevor Zegras (2-7-9), Matthew Boldy (5-3-8), Alex Turcotte (1-7-8), and Ryder Rolston (3-1-4). The U.S. ended its third international competition, the 2018 Five Nations in Veliky Novgorod, Russia, with a 4-0 record. Jack Hughes (Orlando, Fla.) was awarded Best Forward in the tournament, and Cole Caufield (Stevens Point, Wis.) was named the tournament’s Highest Scorer. Full tournament score updates, schedule, and statistics for the 2018 Under-18 Five Nations Tournament can be found at the official tournament website here, and U.S. updates can be accessed at its tournament homepage here.